(Phys.org)—Advanced ceramic composites can withstand the ultrahigh operational temperatures projected for hypersonic jet and next generation gas turbine engines, but real-time analysis of the mechanical properties of these space-age materials at ultrahigh temperatures has been a challenge – until now. 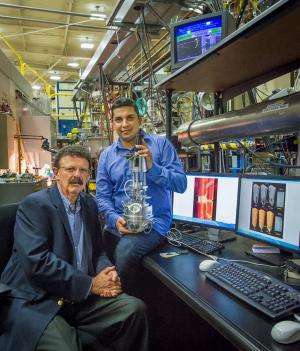 Researchers with the U.S. Department of Energy (DOE)'s Lawrence Berkeley National Laboratory (Berkeley Lab) have developed the first testing facility that enables CT-scanning of ceramic composites under controlled loads at ultrahigh temperatures and in real-time. Working at Berkeley Lab's Advanced Light Source (ALS), a premier source of X-ray and ultraviolet light beams, the scientists created a mechanical testing rig for performing X-ray computed microtomography that reveals the growth of microcrack damage under loads at temperatures up to 1,750 degrees Celsius. This allows engineers to compute a ceramic composite material's risk of structural or mechanical failure under extreme operating conditions, which in turn should enable the material's performance and safety to be improved. "The combination of our in situ ultrahigh temperature tensile test rig and the X-rays at ALS Beamline 8.3.2 allows us to obtain measurements of the mechanical properties of advanced ceramic materials at temperatures that are literally unprecedented," says Berkeley Lab materials scientist Robert Ritchie, who led this work. "These measurements, coupled with wonderful 3D images and quantitative data of the damage under load, can provide crucial information to permit accurate predictions of a ceramic composite's structural integrity and safe lifetime." Ritchie, who holds joint appointments with Berkeley Lab's Materials Sciences Division and the University of California (UC) Berkeley's Materials Science and Engineering Department, is the corresponding author of a paper describing this work that has been published in the journal Nature Materials. The paper is titled "Real-time quantitative imaging of failure events in materials under load at temperatures above 1,600 C." Co-authors of the paper were Hrishikesh Bale, Abdel Haboub, Alastair MacDowell, James Nasiatka, Dilworth Parkinson, Brian Cox and David Marshall. Ceramics made from clay have been used as construction materials for thousands of years and are renowned for their ability to resist damage from water, chemicals, oxidation and – most importantly - heat. Ceramics can stand up to temperatures that would melt most metals. However, traditional ceramics also suffer from a serious deficit – brittleness. Today's advanced ceramics for extreme structural applications are much stronger and tougher. They're reinforced with ceramic fibers to form composites that can be structured along the lines of natural materials such as bone and shells. Jet or turbine gas engines made from ceramic composites would weigh considerably less than today's engines and operate at much higher temperatures. This translates into far greater fuel efficiencies and reduced pollution. Still, while ceramic composites are far less prone to fracture than their clay ancestors, tiny cracks can form and grow within their complex microstructures, creating potentially catastrophic problems. "Like bone and shells, ceramic composites achieve robustness through complexity, with their hierarchical, hybrid microstructures impeding the growth of local damage and preventing the large fatal cracks that are characteristic of brittle materials," Ritchie says. "However, complexity in composition brings complexity in safe use. For ceramic composites in ultrahigh temperature applications, especially where corrosive species in the environment must be kept out of the material, relatively small cracks, on the order of a single micron, can be unacceptable." Exactly how micro-cracks are restrained by the tailored microstructures of a ceramic composite is the central question for the materials scientist seeking the optimal composition or architecture, and the design engineer who must predict the failure envelope, Ritchie says. The only reliable way to answer this question is through measurements made at ultrahigh temperatures. ALS Beamline 8.3.2, which is powered by a 6 Tesla superconducting bend magnet, is designed for X-ray computed microtomography, a technology that provides non-destructive 3D imaging of solid objects at a resolution of approximately one micron. 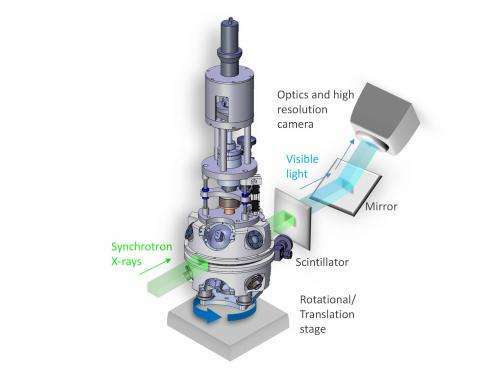 With the addition of their unique tensile testing rig, Ritchie and his colleagues can maintain in situ ultrahigh temperature environments in either inert or oxidizing atmospheres while obtaining real-time 3D images of sample microstructures. 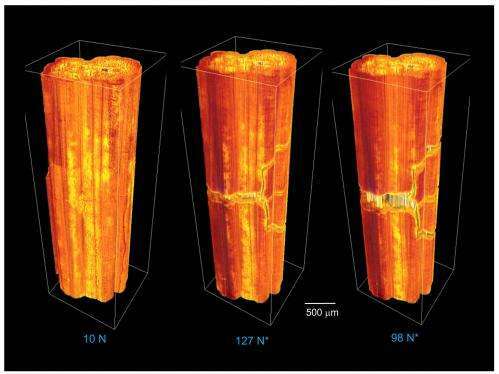 In their Nature Materials paper, Ritchie and his coauthors describe obtaining 3D images of the microstructures of ceramic composite samples made from silicon-carbide at sufficient resolution to observe the formation of microcracks and other forms of internal damage as a function of load. "The results of our tests provided vital information pertaining to the underlying failure mechanisms within ceramic composites that can be used to optimize their performance, Ritchie says. "The capacity for validating virtual testing models through direct, real-time, non-invasive experimental observations should greatly advance our understanding and help promote the technological innovation of ceramic composites."